The Ropucha class large landing ship 102 Kaliningrad passing through Dardanelles. Photo: Aktifhaber. 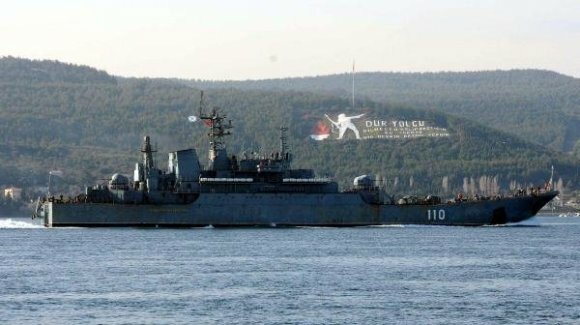 The Ropucha class large landing ship 110 Alexander Shabalin passing through Dardanelles. Photo: Aktifhaber. 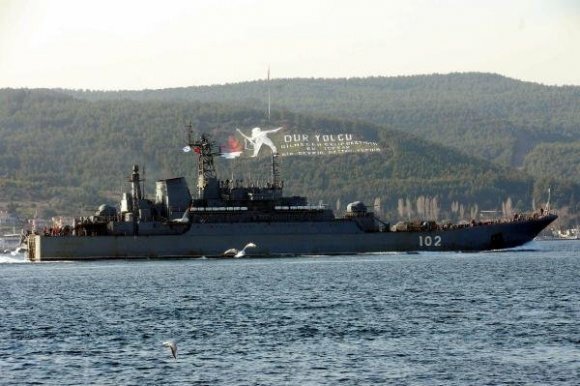 More Russian warships passed through Dardanelles today. Two Ropucha class warships usually deployed in the Baltic Fleet 102 Kaliningrad and 110 Alexander Shabalin passed through Dardanelles on their north bound journey. Do you think it’s possible they are ferrying people and cargo from Syria, and will be passing back through again? Hi Kevin, in my humble view the Kaliningrad and Alexander Shabalin are going to pass through the Turkish Straits again when they return to their home port in Baltics. In the last week 5 large landing ship able to carry up to 1.500 troops and 2.500 tons cargo returned to the Black Sea from the Med. We do not know that was inside butthe whole action has the typical aura of an evacuation of Russian “military advisers” and military hardware from Syria. Many thanks for the reply. I’m just amazed there is no media coverage of this at all. Russia is having happen to them, exactly what happened for my country when Saigon fell in April 1975. Thanks again for your reporting on this.